This brand new men’s scent from the refined house of Lanvin is something special! 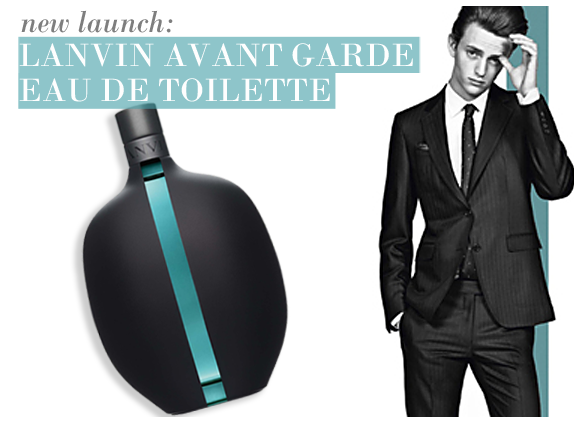 Lanvin Avant Garde is the first men’s release since 2009’s L’Homme Sport, and its definitely worth the wait. Inspired by Lanvin’s Autumn/Winter ready-to-wear collection, the eau de toilette blends style with refinement and a touch of that unique Lanvin edge. From the clean lines of the bottle to the unexpected lavender-beeswax-georgywood fragrance, Avant Garde exudes charisma. The scent opens with a top accord of bergamot, black pepper and pink peppercorn, a vibrant meeting of both freshness and spiciness. An unusual heart of lavender and beeswax defies expectations, while a resonating drydown of georgywood, vetiver and sweet benzoin provide intense longevity. This entry was posted on Thursday, January 26th, 2012 at 9:40 am and is filed under Fragrance, Men, New products. You can follow any responses to this entry through the RSS 2.0 feed. You can skip to the end and leave a response. Pinging is currently not allowed.